With just days before Brooklynites head to the polls and decide who will be the borough’s next district attorney, a position briefly held and transformed by the late Kenneth Thompson, the field is crowded with Democratic candidates, each vying to present him or herself as the most progressive, best-suited option to carry on Thompson’s legacy. Of the six Democratic candidates who will be on Tuesday’s ballot, the frontrunner -- having raised the most money and scooped up endorsements including from elected officials, major labor unions, political clubs, and women's’ rights groups -- is Eric Gonzalez, who was annointed as acting district attorney by Thompson before he died of cancer at age 50 in 2016. Though several of his challengers are energetic debaters and well-qualified for the role, unless someone has differentiated him or herself enough and gets out the vote in a big enough number, Gonzalez’s built-in credibility as Thompson’s “heir” may largely carry him to a full first term of his own. Thompson, Brooklyn’s first black district attorney, beat out longtime top prosecutor Charles Hynes -- who held the seat for two and a half decades -- in 2013 by campaigning on a platform of reform, and by most accounts was making impressive strides in transforming the criminal justice system in Brooklyn, including by overturning several of Hynes’ faulty convictions, before his death. While district attorneys have historically kept a low-profile, those who hold the seat wield significant influence and discretion over the borough’s crime fighting policies, and without term limits, the same person may control the office for decades. 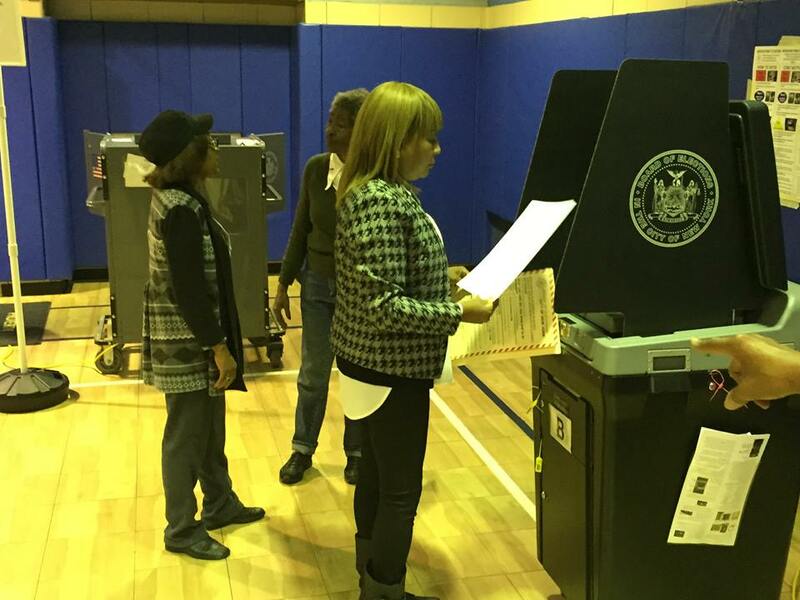 However, in Brooklyn, the seat could potentially change hands for the third time in five years, and with crime statistics at a record low, the conversation has taken a drastic turn from cracking down on crime to compassionate law enforcement, removing structural racial bias, and ending the school-to-prison pipeline. The election comes during a period of heightened public awareness about police and prosecutorial treatment of communities of color, cementing a shift energized by Thompson’s victory, where the conversation in Brooklyn is not about which candidate will be toughest, but who will most dramatically reform the office, building on Thompson’s accomplishments, which include ending the prosecution of certain low-level offenses and beginning the process of negating hundreds of thousands of outstanding arrest warrants related to such offenses. Thompson’s conviction review unit, which has exonerated 23 wrongfully convicted people, has become a model for prosecutors around the city and country, something Gonzalez has continued to prioritize.. The other candidates, including prosecutors Marc Fliedner, Patricia Gatling, Ama Dwimoh, Anne Swern, and City Councilmember Vincent Gentile, who is term-limited, have largely sought to present themselves as the most progressive of the bunch. However, with similar messaging and overlapping resumes -- all except for Gentile worked under Hynes during his scandal-marred tenure -- the candidates have largely failed to distinguish themselves from each other during forums and in interviews. The only one striking a slightly more moderate tone is Gentile, who touts the accomplishments of City Council to reform the system legislatively. The fact that Gonzalez was hand-picked by Thompson helped him accrue extensive institutional support early in the race, and made him an easy favorite among unions and donors. Helen Schaub, New York State policy and legislative director of 1199SEIU, the large and powerful healthcare workers union, noted that the union was an early backer of Thompson and therefore naturally trusted his chosen successor to continue his work as Brooklyn’s lead prosecutor. “We met with a number of the candidates, and [Gonzalez’s] ability to actually make the changes and the fact that Ken Thompson trusted him to make those changes made him the obvious choice for endorsement,” said Schaub. Gonzalez won over feminist icon Gloria Steinem, who cited his initiative to tackle sexual assault on college campuses, his efforts to protect immigrants in courts, and his history as a domestic-violence prosecutor. Gonzalez also had a head start on fundraising, pulling in well over $1 million over the course of his campaign. Swern has raised about half that, but the other candidates fall far behind, with Fliedner consistently lagging farthest. Fliedner held just $11,000 in his account at the time of his 11-day pre-primary Board of Elections filings. Dwimoh, one of two black women in the race along with Gatling, has a compelling story and some name recognition in the borough as a top aide to Borough President Eric Adams, but her claim that she left Hynes’ office because she disagreed with the direction it was headed in did not ring true after her fellow candidates -- some of them former colleagues -- pointed out that she had been investigated and pressured to resign for allegedly mistreating her subordinates. “Ama is the only candidate who publically rejected Joe Hynes and supported Ken Thompson and worked on the campaign with Ken to develop his agenda,” said Dwimoh’s spokesperson, Evan Thies, repeating his client’s refrain from throughout the campaign. Citing her work at Adams’ office, Dwimoh says her focus would be on fixing the root causes of crime, like lack of adequate housing or social programs in low-income communities. Fliedner, who as former chief of Thompson’s civil rights bureau successfully prosecuted then-NYPD officer Peter Liang for the shooting of an unarmed black man, Akai Gurley, in 2016, has presented some of the most ambitious plans for incarceration alternatives and elimination of predatory bail practices. Fliedner left Thomson’s office to start his own civil rights practice last June, and has expressed disappointment Liang’s conviction was downgraded from manslaughter to criminally negligent homicide. Thompson ultimately recommended no jail time for the officer. Fliedner has support from Gurley’s family and other relatives of victims of police violence, but has failed to raise a significant amount of money to help get his message out and build more name recognition. Gatling has her own civil rights record as former head of the city’s Human Rights Commission, though the agency was criticized for inaction on her watch, and critics have noted that she moved back to Brooklyn from Manhattan fairly recently. 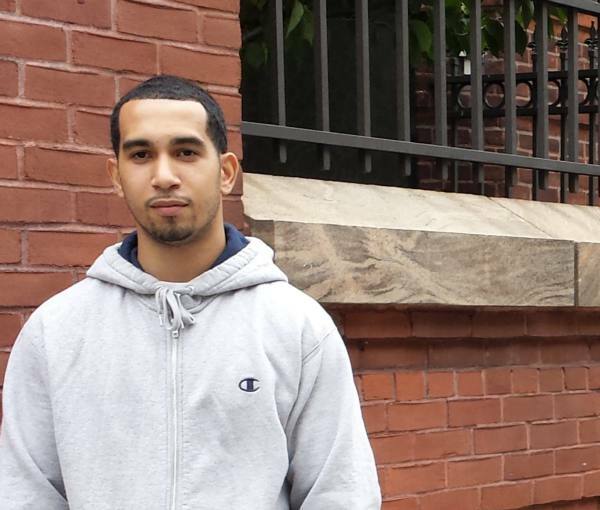 Swern, who at the district attorney’s officer ran its Drug Treatment Alternative-to-Prison (DTAP) program and is active in local political clubs, has the backing of several prominent Democrats in Northern Brooklyn, including state Senator Daniel Squadron, Assemblymember JoAnn Simon, and City Council Member Stephen Levin. She's also been endorsed by the Independent Neighborhood Democrats. Several progressive political clubs in Park Slope, Carroll Gardens, and other more affluent, mostly white areas of Brooklyn formally endorsed Gonzalez, though at least one club said its members were nearly split between the acting district attorney and Swern. 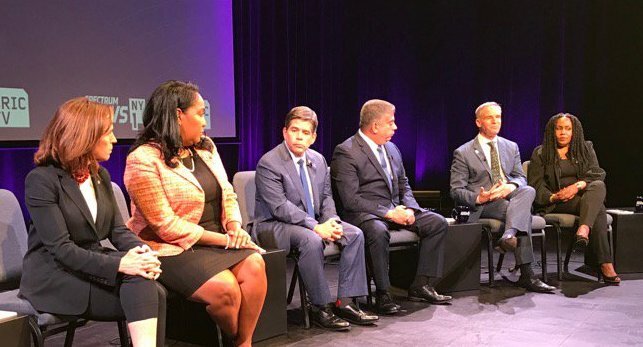 While no candidate came to the race with significant name recognition and no one has made a huge splash to garner more media attention, Brooklyn progressives say they welcome the lively discussion about reducing arrests for low level offenses, alternatives to incarceration, police accountability, expediting the closure of Rikers Island jails, bail reform strategies, and ideas for protecting undocumented immigrants amidst federal crackdowns. Thompson’s 2013 victory was seen as a major upset in Brooklyn, and was the first in a series of victories for progressives and police reform advocates at district attorney offices across the nation. Last year, Chicago’s Cook County elected its first black district attorney, Kim Foxx, who vowed to reform the county’s criminal justice system. In fall 2016, in Austin, Texas, progressive reformer Margaret Moore was elected to replace retiring District Attorney Rosemary Lehmberg and took steps to immediately restructure the office by firing and reassigning dozens of staff attorneys. In May, Philadelphia voters picked Larry Krasner, a political outsider and former civil rights attorney who has defended Black Lives Matter and Occupy Wall Street protesters free of charge, over six other Democratic newcomers, after disgraced “reformer” DA Seth Williams, also a Democrat, decided not to seek reelection following a federal corruption trial. “Nationally, people are paying a lot more attention to prosecutor accountability. 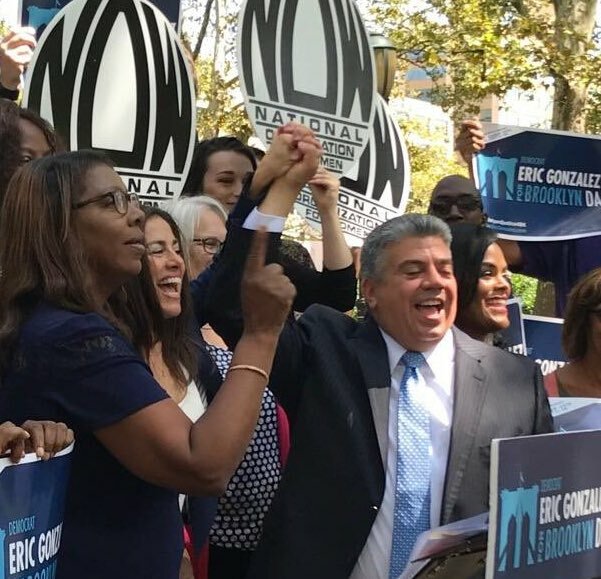 Through the non-indictments of high profile cases involving officers, the public has learned what a prosecutor's powers can be and the direct influence they have on the way the criminal justice system works,” said Alyssa Aguilera, Co-Executive Director of VOCAL-NY Action Fund, which endorsed Gonzalez. All of the candidates appear well aware of these political currents. Even Gentile, a former Queens prosecutor who represents one of Brooklyn’s last areas of Republican prowess and might have been expected to take a more moderate, tough-on-crime perspective, has preached a similar message of ending mass incarceration and the “broken windows” approach to aggressively enforcing quality of life offenses. While the philosophical consensus may make for inconclusive debates, the conversation marks continued shift for the borough and is still fairly unprecedented, according to Brooklyn College sociology professor and criminal justice expert Alex Vitale. “It's remarkable that for the most part the candidates seem to be vying against each other over who is the most progressive reformer. It's the most shocking development in terms of the DA race. Typically the debate is about who is the toughest on crime,” said Vitale. Aguilera said that regardless of the outcome, she anticipates that the Brooklyn district attorney’s office will continue to set the tone across the nation. The election also coincides with the early presidency of Donald Trump, whose administration has targeted immigrants, including those who may have committed low level, nonviolent offenses, which has blown political winds in New York City farther to left, so much so that even political foes on varying points of the Democratic spectrum are beginning to sound the same. During his tenure, Gonzalez has directed the attorneys under his charge to pursue charges in ways that limit exposure to possible immigration enforcement. As the determinative primary vote approaches, ambivalence about the candidates is reflected across the borough. The New Kings Democrats, a progressive reform club that meets in Fort Greene and has pushed for the sort of changes being discussed in the district attorney race, met with all the candidates and along with other Democratic clubs in the area held a candidates forum in June. However, despite a “rich discussion” and extensive interviews with the six contenders, New Kings ultimately did not endorse anyone for district attorney, because no single candidate hit the NKD requirement for endorsement. “Nobody meet the two-thirds threshold, so there was no consensus. But whoever wins we'll see what they do in office and hold them accountable to it,” said Anusha Venkataraman, president of NKD. Among civil rights and police reform advocates serving Brooklyn’s communities of color, the sentiment is similar. “Unlike when Thompson was running, and there were very clear distinguishing features, there’s no one who makes many of the folks I know want to run out and embrace a particular candidate,” said Mark Winston Griffith, executive director of the Brooklyn Movement Center, who noted that each candidate has issues with his or her campaign. While Gonzalez’s public appearances at forums and debates are less impassioned and memorable than some of his challengers, he has showcased his competence and experience in one-on-one interviews, according to a member of the local Working Families Party chapter. Aguilera, whose organization endorsed Gonzalez early on, agreed. "He is a smart person, he spent a lot of time with us talking a lot about policy, knows how to run the office, and he's followed through on some commitments already to enact some reform. He grew up poor in Brooklyn from a Latino community; he understands directly and that carries a lot of weight in a race where everyone is saying the same thing,” Aguilera said. “We see comradery and potential from a person who has lived through what low-income communities of color have been through." While Swern and Fliedner bring passion and stage presence to debates, whereas Gonzalez is relatively subdued, their remarks may come across as disingenuous pandering to communities of color. At a recent forum hosted by Faith in New York Action Committee in Bedford-Stuyvesant, Swern appeared to be the favored candidate of those in attendance. Her impassioned criticism of the injustices with predatory bail practices were punctuated by cheers from the crowd, including shouts of “We love you, Anne!” Outside, a disproportionate number of canvassers for Swern, clad in “Black Lives Caucus” shirts, handed out fliers. Later, Gatling’s campaign accused Swern of paying the canvassers at the event -- a claim Swern and the Black Lives Caucus, a spinoff group of the Black Lives Matter movement, denies. At the same event, Dwimoh called out Fliedner, who is white, after he declared that he was the only person on the stage willing to say “Black Lives Matter” out loud. “I don't have to say 'Black Lives Matter,'” Dwimoh retorted. "I live it. I am a black woman in America. How dare you!" Local elections often come down to money and endorsements -- and the canvassing and get out the vote efforts they can both produce -- and other factors that can sometimes tip the scales in favor of one candidate. With a crowded field of little-known candidates in what is expected to be a low-turnout primary, it is hard to decipher how the election will go, other than to say that Gonzalez has had several clear advantages. The primary election for Brooklyn District Attorney takes place on Tuesday, September 12, and the Democratic nominee will be the presumptive winner of the seat. Last week, 5,000 eighth graders got the exciting news that they were offered admission to one of the city's eight test-in Specialized High Schools, which offer a quality public school education unmatched in the country. But while the vast majority come from poor, working class and immigrant families, as has always been the case, once again far too few come from the black and Latino communities. Black and Latino students comprise a large majority in the city's public school system and should be better represented among those offered admission to its top high schools. Unfortunately, this year about 500 fewer black and Latino students sat for the test compared to last year, and the percentage of these students offered admission declined as well. The school system, like the city it serves, is heavily segregated, but this lack of racial and ethnic diversity in our test-in schools is unacceptable for many reasons. Still, doing away with the test as the sole criteria for deciding admission and switching to inherently subjective multiple criteria would do little to ameliorate the imbalance and could make it worse according to last year's study by NYU's Institute for Education and Social Policy. The city must instead invest the resources – both financial and intellectual – and take proactive steps on both a long-term and an immediate basis in order to diversify admissions to our best schools. A program of enriched educational opportunity must be instituted in every neighborhood to permit all children to have a fair chance of success on the test and in life. Gifted and Talented Programs must exist in every district. Enriched education, especially in math and English language courses, must be available in every middle school in the city. When 53 percent of the students at test-in schools come from only 15 percent of middle schools, the fundamental answer to the problem of underrepresentation is clear. Immediate actions must be taken to increase the numbers of students from underrepresented communities sitting for the test. And, increased attention must be paid to better preparing underrepresented students to do well enough on the test to gain admission. There is no fixed passing grade on the test. "Passing" is simply a function of scoring high enough to rank among the 5,000 highest scoring students to qualify for admission to one of the schools. 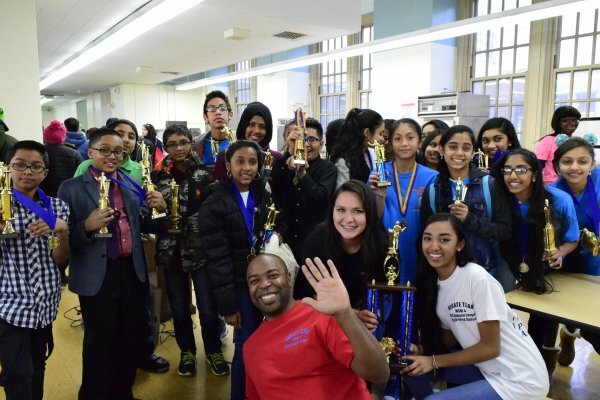 The Brooklyn Tech Alumni Foundation, which I head, with the support of National Grid, has worked with Brooklyn Tech to run an innovative pilot STEM (Science, Technology, Engineering and Math) Pipeline program for the past three years that reaches out to underrepresented middle schools, identifies children of promise and provides them with accelerated coursework and test prep. The program starts with rising seventh graders and offers them an intensive two year experience with classes during the summers and on Saturdays during the school year. We have had good success during the first two years that students in the program have sat for the test. This year, students received offers from Brooklyn Tech, Stuyvesant, and Brooklyn Latin, all specialized schools. Half of last year's students in the program – and nearly two-thirds this year – offered admission to Tech are black or Latino. We are encouraged by the support for diversity at specialized high schools shown by Albany legislators in both chambers who are proposing dedicating funds to create similar pipeline programs in every test-in school. 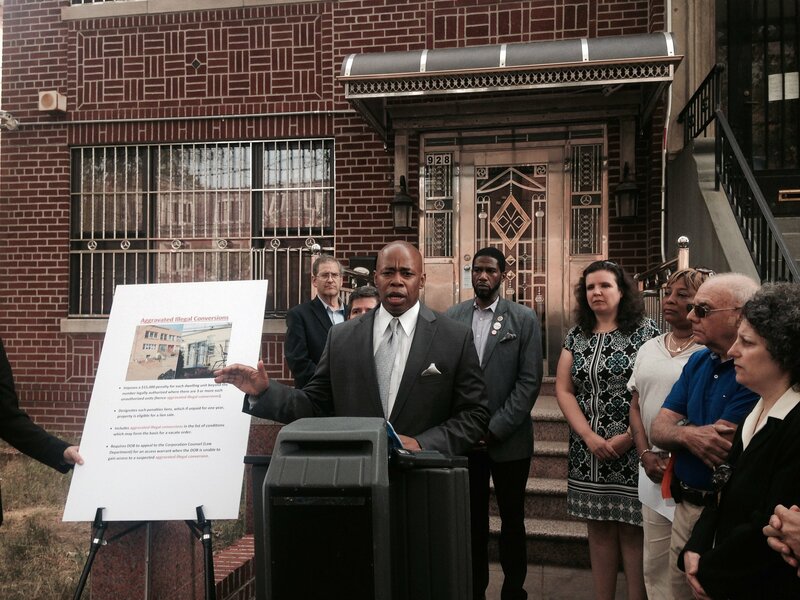 This would cost less than $1.3 million a year, or $2.5 million over two years, and enable all eight specialized high schools to run outreach and test preparation programs in underrepresented middle schools throughout the city. While Mayor de Blasio is committed to combatting educational and economic inequality, it is still the case that a child's chances of educational success are closely correlated to where he or she grows up. Because test-in schools should serve students from every neighborhood, there is a special obligation to give all promising students tools to succeed. The answer is not to do away with an admissions test, but to make that promise of social equality real by committing resources and intellectual firepower so that every academically promising child, regardless of their neighborhood, has a fair chance of succeeding on the test, and beyond. Larry Cary is president of the Brooklyn Tech Alumni Foundation. The $36,000 salary bump for Council members is about the same amount of money that many of their staff members make in a year. These are aides filling roles such as communications director, scheduler, and community liaison. Chiefs of staff usually make quite a bit more. At a hearing on the bills two days before the vote, several Council members spoke in support of also providing pay raises to their staff members. The silent demonstration by staffers from the offices of Council Members Inez Barron and Rosie Mendez was itself a coordinated effort done with the support of Barron and Mendez. City Council members set the salaries of their staff members and decide how many aides to employ - the average staff size is about seven. The amount Council members choose to spend on salaries comes out of their office budgets, which are set by the Council Speaker’s office. City Council members say that a push to increase member budgets was initiated when it became clear that Council members themselves would be getting raises. In early February, at about the same time the Council was voting through raises for all city elected officials, Council Speaker Melissa Mark-Viverito provided Council members with about $29,500 each in additional funding for their offices. “In my tenure, I have increased the budgets of Council members, and I plan to do that again,” Mark-Viverito said at a Feb. 18 event organized by the Center for Community and Ethnic Media at CUNY Graduate School of Journalism. According to information obtained by Gotham Gazette through a Freedom of Information Act request, most Council members are now receiving a total of $409,000 to run their offices in the current fiscal year (FY 2016). That $409,000 is used by Council members to pay the rent for their district offices, the salaries of their staff members, and OTPS, or other than personal services, which include supplies, equipment, contractual services, and other operating expenses. The recent $29,500 bump will allow Council members to give raises to their staffers, if they so choose. Even with an increase to staff salaries, aides and Council members alike criticize current dynamics, which, they say, leave staff members significantly underpaid and overworked. Members argue that they are forced into a no-win decision whether to hire fewer staff members or pay more aides less and decry a situation where they lose staff to higher-paying government jobs at city agencies. They also say that current pay structures diminish the professionalism of Council staff and some call for more drastic increases to their office budgets. As mandated by law, Mayor de Blasio appointed an independent commission to review the salaries of elected officials last September, setting off a process that concluded on Feb. 19, when the mayor signed into law a package of legislation raising the salaries of all New York City elected officials. This includes the mayor, comptroller, public advocate, five borough presidents, five district attorneys, and 51 City Council members. The City Council held a hearing on the legislation Feb. 3, and approved the package of raises and reforms on Feb. 5. The budget increase, like Council members’ salary increase, is retroactive to Jan. 1, making it part of the current fiscal year 2016 budget. Council members and Mark-Viverito may look to include another increase during fiscal year 2017. The FY17 city budget is being negotiated and will go into effect July 1. Equalizing most members’ office budgets is a part of Mark-Viverito’s efforts to reform and democratize the City Council. In fiscal year 2015, about half of the City Council received $382,000 for their office budgets, while other members received $377,000. Council sources say this is another example of Mark-Viverito moving away from the practices of her predecessors, who used funding levels - both for office budgets and discretionary money to award nonprofits - to exercise control, reward allies, and punish those who were seen as out of step. Under Mark-Viverito, five Council members have received more than others for their office budgets. 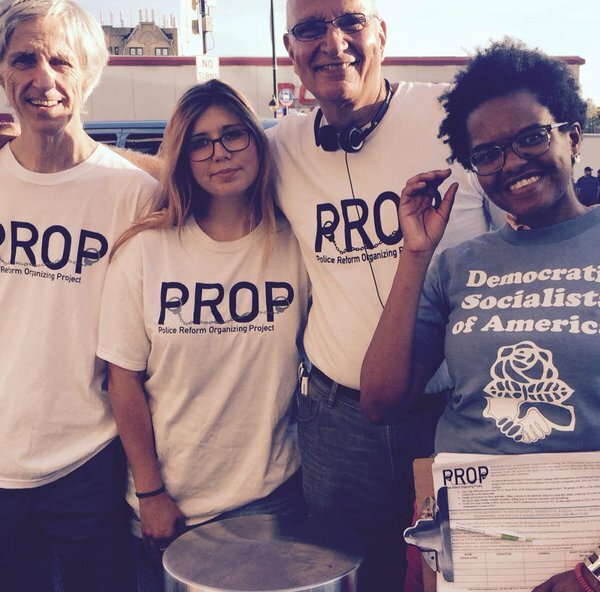 For the current fiscal year, chair of the finance committee Julissa Ferreras-Copeland, chair of the land use committee David Greenfield, and Majority Leader Jimmy Van Bramer all receive about $70,000 more to run their offices, with an annual budget of $479,000. Each of these three is provided increased funding based on heightened levels of responsibility. Council Member Donovan Richards, whose district includes the Rockaways and requires him to run two offices, receives $454,000 this year. Council Member Alan Maisel has the highest office budget of any Council member - $489,000 annually - $80,000 above the majority of Council members. When asked why his office budget was so much higher than that of the average Council member, Maisel told Gotham Gazette, “I have no idea. I don’t know what the reason is - maybe something built in from a previous Council member? I don’t know.” Maisel seemed surprised to hear he receives a larger office budget than other Council members, and asked what others receive. The speaker’s office was also unable to specify why Maisel receives a significantly higher office budget, saying only that the speaker retains the discretion to provide additional resources in limited circumstances - such a leadership positions, committee responsibilities, and hardship. 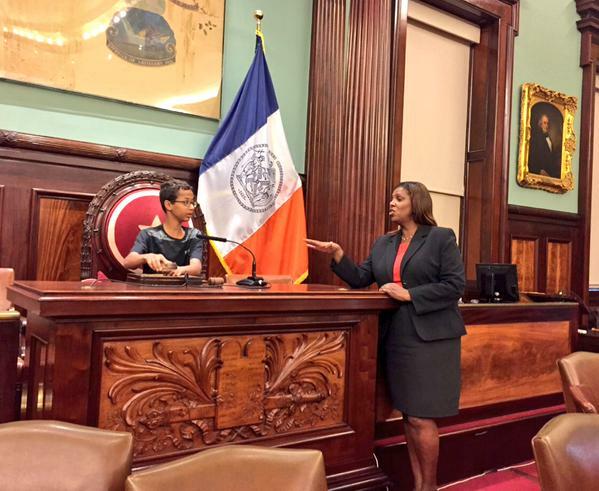 Maisel succeeded Lew Fidler on the Council starting in 2014, the same year Mark-Viverito became speaker. Simply increasing Council members’ office budgets does not guarantee their staff members will receive a raise. Some Council members may choose to distribute the added $27,000-$32,000 in a way that gives each of their aides a pay raise, others may use the money to hire one additional staff member. Some Council members may not even use the added funds for salaries, but rather, to pay rent for a better office space or an additional office, or use it for OTPS. The $409,000 most Council members currently receive to run their offices creates a certain sense of equity, but does not take into account differing needs. Office rent may be higher on the Upper East Side than on Staten Island, for example, while Council members serving poverty-stricken districts may have cause to provide more robust constituent services than others, requiring them to hire additional constituent liaisons. Some Council members may need to offer different language services to their constituents. Council members may hire as many staffers as they see fit, and the number of people they employ as well as the positions they name largely depend on the differing needs of their districts. Staff listings indicate Council members employ an average of seven aides, with some employing as many as nine or as few as four. Council members must choose between hiring a smaller staff and paying each aide more, or hiring more and paying each less. 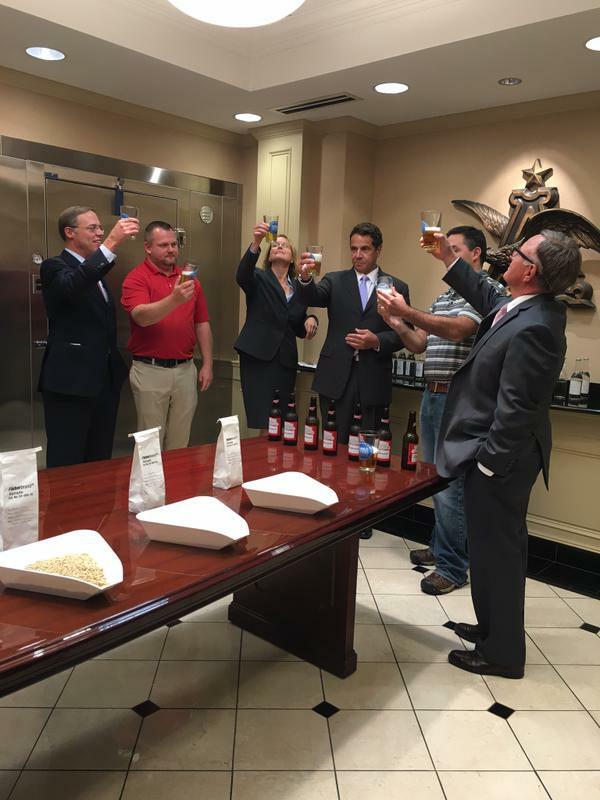 Staffers often end up filling numerous roles, with aides in many offices serving as both legislative director and budget director, legislative liaison and scheduler, or director of communications and legislation. Council aides are often in their twenties, working long hours, and eyeing other, higher-paying positions in government. Salaries for the same position can vary widely across offices, with Council members’ chiefs of staff - the highest paid staff position - receiving between $37,700 and $92,000 annually, according to 2015 payroll records compiled by The Empire Center. Most communications directors received between $28,700 and $50,000. During the only hearing on the package of bills that raised the salaries of Council members by $36,000 and modified rules by which members earn additional money, Council members defended the raise by pointing out how hard they work, that their responsibilities have increased over the years, and that they work long hours. The workload of Council aides has increased as well. “We work more than 60 hours a week,” Council Member Ydanis Rodriguez said during the Feb. 3 hearing. “For me, this is a big compromise that we’re doing…our salaries should be $175,000,” added Rodriguez, who in 2015 paid his seven staffers at least $15,038 and at most $56,231. 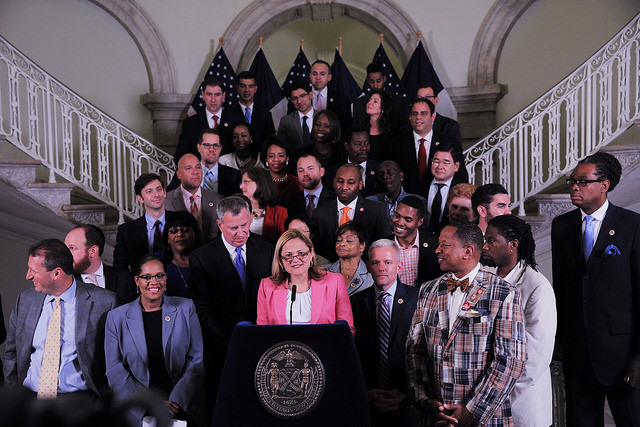 “Council Members have already made 105% more bill and resolution drafting requests, introduced 41% more bills and enacted 32% more Local Laws than through the same time period in the immediately preceding session,” Mark-Viverito added. Given Council members’ rationale that their workload has increased and they therefore deserve a raise, Joy Simmons, chief of staff for Council Member Barron, told Gotham Gazette she believes “staff members should also get raises, because the burden of that work falls on our shoulders…there’s many staff members living paycheck to paycheck." Low wages aren’t only hurting staffers - they diminish the professionalism of the City Council itself, Council members argue, and lead to a high turnover rate. Torres, Williams, and Reynoso believe Council members are given too few resources to adequately compensate their aides, causing Council members’ offices to become “a training ground for other agencies or other companies, because they see the work that the staff does, and they come and get them and we just can’t compete because there’s not enough money,” in Williams’ words. Ultimately, it is up to the Council speaker to set the office budgets for members. Yet, some question why Council members don’t push more aggressively for a significant increase to their office budgets to be included in the city budget. “These Council members have supported other workers out there looking for pay increases and looking for protections within their industries - you know, airport workers, retail workers,” Ndigo Washington, legislative director for Council Member Barron, told Gotham Gazette, expressing dismay at the fact that Council members will so readily push for higher wages for other workers, but leave their own staffers poorly compensated. More could be done to address the wage situation beyond simply increasing Council members’ office budgets. There should be standards, some Council members argue, for a minimum salary for a chief of staff, legislative director, budget director, deputy chief of staff, and all typical staff positions. “I think there’s an argument for a minimum,” Torres said, which he said would likely require a change to Council rules. A minimum standard could help, Council members and staffers say, though setting a uniform pay rate for certain positions is something to “be wary of,” according to Williams, given the vastly different roles and responsibilities of staffers from office to office. In the state Assembly, members’ office rents and utilities are paid through the central office. If the City Council were to alter the rules to allow rent to be paid centrally, it could free up money in Council members’ office budgets to be used to better compensate staffers, assuming significant deductions in those budgets would not be made. Another issue raised by Washington and Simmons, both aides to Council Member Barron, is ensuring raises for staffers. “We’ve been told in the past that we might get a cost of living increase,” Washington said, “but we don’t know.” There is also the lack of job security or protection, as staffers are considered at-will employees. Council sources say they was a cost of living increase in 2015, one that applied to Council employees (working on the Council central staff and for members) with qualifying longevity. “It’s a professional position and we’re reducing it to the status of a glorified internship,” he added, of aide roles. In a recent ten-day period I had experiences that taught me new things about bad NYPD practices, reinforced my cynicism about the lame way that mainstream politicians, including officials who self-identify as progressives, posture on policing issues, and strengthened my determination to press aggressively for fundamental and meaningful changes in NYPD policies. My organization, PROP - the Police Reform Organizing Project - continues to monitor NYPD practices and advocate for real change. *On a monitoring visit to the Brooklyn criminal court -- PROP representatives and volunteers regularly observe proceedings in the arraignment parts of the city's criminal courts as a way of tracking NYPD 'broken windows' arrest practices -- I stood on a line of about 45 people waiting to pass through the metal detector. 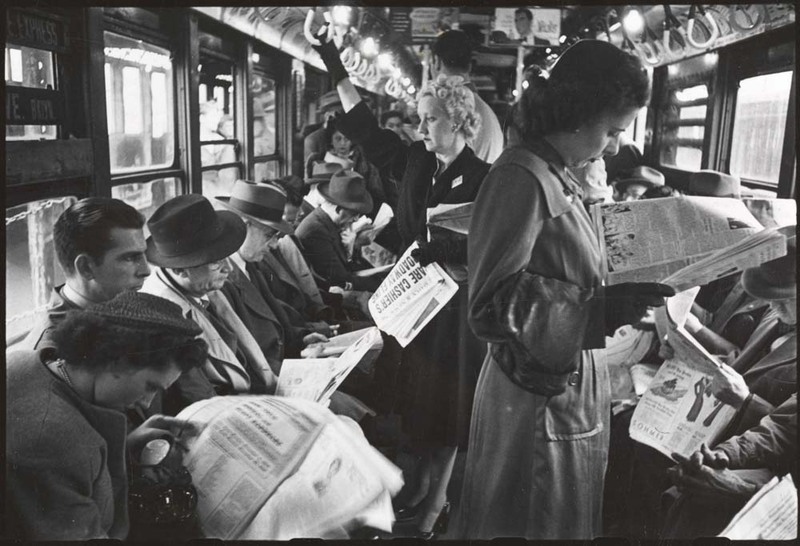 I was the only white person -- everyone else was African-American or Latino, the vast majority of whom dressed in clothes suggesting that they were members not of the well-to-do professional class, but of the low-income or working classes. *On that morning, the Brooklyn misdemeanor arraignment part heard 34 cases, all men of color whom the police had arrested and locked up. Each of these men walked out of the courtroom, meaning essentially that no court official, including in most cases the prosecutors, considered the defendants dangerous or predatory. The charges included suspended license, theft of services (usually fare-beating), marijuana possession, disorderly conduct, and open alcohol container. *At a meeting later that day, a fellow police reformer reported that he had recently attended a police/community meeting where neighborhood residents had a discussion with officials from the local precinct. The community members expressed concern about a recent armed robbery and asked what the police were doing about it. The officials responded by saying that they were "summonsing like crazy," meaning that police officers were issuing many criminal summonses to people in the neighborhood for representative 'broken windows' infractions/activities like being in the park after dark, littering, carrying an open alcohol container, or riding a bike on the sidewalk. Community members raised the pointed question: But what are you doing to actually investigate the crime and catch the perpetrators? *At a meeting with a journalist and me, a police officer who is considering coming forward to publicize the ill effects of the NYPD's quota system on officers and New Yorkers alike, reported on the following matters: under the pressure to "make their numbers" each month, some officers working in a precinct with a cemetery within its borders will issue what are known as "cemetery summonses," meaning that they will enter the graveyard and write up tickets with the names of dead people that that they find on the tombstones. Some precincts - those that serve white well-to-do areas, for example - have no quotas. One of the first questions that an officer new to an inner-city precinct asks is: "What is the number?" And, again under the pressure of the quota system, some officers will for most of the month ignore a neighborhood "hot spot," a place where crime such as drug dealing or prostitution takes place in the open, and if they have not met their quotas, will round up the people at those sites at month's end. *A PROP volunteer, a teacher who instructs students at night classes in the City College system, reported the following stories that he heard during a class discussion about discriminatory NYPD practices: two students of color, both women - one African-American and the other Latina - recounted unsettling encounters with officers on select buses in the Bronx. In one case the woman couldn't at first find the receipt when the officer approached her, so the officer began writing up the summons; she did eventually find it, but when she displayed it, the officer said that it was too late, that he had already filled out the ticket; she has refused to pay the fine and plans to fight the ticket. In the other case, the woman made a mistake in pressing the buttons of the ticket machine at the bus stop and ended up with 2 tickets for handicapped people which totaled the same amount, $2.50, as a regular ticket; the officer still issued a summons and, in this case, rather than take the time that she couldn't afford to oppose the summons, the woman paid the fine. *PROP released an analysis of the NYPD's misdemeanor arrest practices for 2015, revealing that 87 percent of those arrests involved people of color compared to 85.8 percent in 2013 and 86.5 percent in 2014. To demonstrate the blatant racism associated with these practices, we focused on some specific kinds of arrests including theft of services, or fare-beating, which at 29,198 was the NYPD's most numerous arrest category for last year. Fully 92 percent involved people of color - in fact, in our year-and-a-half of court-monitoring work, we have observed only a handful of white defendants charged with theft of services. Spokespeople for City Hall and the Police Department made statements in response focused on safety on the subways, but that did not address the extraordinary racial imbalance reflected in the numbers that PROP had spotlighted. Despite these numbers and accounts that demonstrate the undeniable racial bias and deep injustices involved in the NYPD's current application of quota-driven 'broken windows' policing, our city's leading politicians, including Mayor Bill de Blasio and City Council Speaker Melissa Mark-Viverito, announce and occasionally enact the softest kind of modifications that do nothing to fundamentally change or end the NYPD's abusive and discriminatory practices. Out of political considerations - it would be too risky to promote the fundamental police reforms needed - they have effectively abandoned one of their main constituencies: low-income New Yorkers of color, leaving them to the harsh treatment and societal marginalization that result from the practices and policies of the NYPD and the city's criminal justice system. It is up to us police reformers and other concerned New Yorkers to keep hammering away at these issues. Despite our frustration and disappointment of the moment, we know that silence will kill all hope of achieving our shared goal of a fair, safe, and inclusive city for all New Yorkers. Bob Gangi is Director of the Police Reform Organizing Project. On Twitter @PROPNYC. 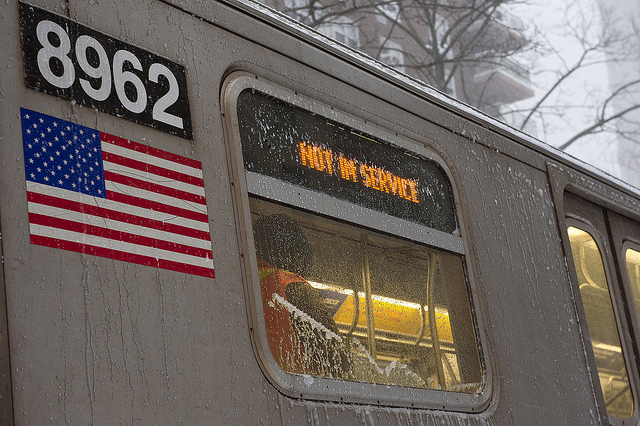 Hysterics aside, it’s unlikely that the MTA would do a full, year-long double-tube shutdown. The most plausible plan is a long series of “nights and weekends” shutdowns for tube repairs, with the possibility of a brief total closure of both tubes to finish them “Fastrak”-style while rehabs of the 1st Avenue and Bedford stations and additional electrical substations are built. The latter service upgrades, which would permanently boost the line’s peak-hour capacity by 10 percent (a big deal for a subway line often at “crush” capacity during rush hour), depend on the timely success of Senator Chuck Schumer’s request to expedite federal funding. 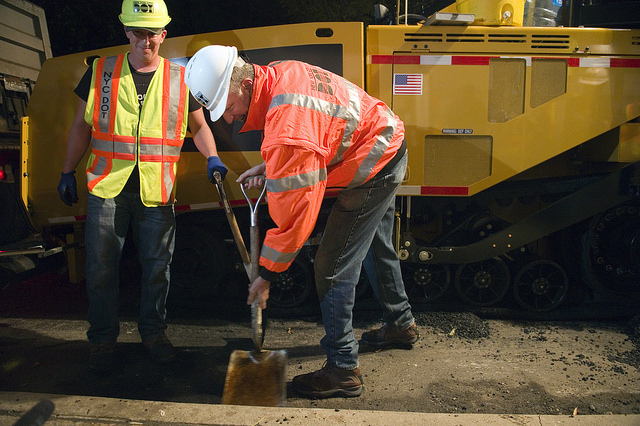 Nothing is certain until the upgrade funding comes through, but some Sandy-related stretch of nights-and-weekends closures is sure to come, as the MTA’s initial bid requests describe a contract lasting about 40 months. If the MTA does indeed briefly close both tunnels—or even just one at a time—what should be done to limit the carnage? First, carpool restrictions (HOV-2, or even HOV-3) on the Williamsburg Bridge during train closures—just like during transit strikes and natural disasters. Previous nights-and-weekends closures of the L have brought “Carmageddon” to the bridge, especially during UberPool and Lyft Line promotions. Ensuring that solo drivers don’t hog every lane is a surefire way to keep everyone moving. I personally remember the bridge congestion during the UberPool $2.75-a-ride L train closure special, as it was both the first time I shared an UberPool and the first time I rode with a carsick middle-aged woman being ill out the back window into the East River. So to minimize the stop-and-go, nausea-inducing congestion—and maximize the potential efficiency of ridesharing services—the city should cooperate with the MTA in implementing HOV restrictions on the bridge, and even dedicating a lane to shuttle buses and the B39. It’s not at all radical to take away a car lane for more efficient transportation modes: The Williamsburg Bridge was built for streetcars. This potential L train crisis is a reminder that better transit redundancy plans are needed for high-volume chokepoints, even if they inconvenience a comparatively small number of drivers. A truly radical long-term proposal would involve permanently replacing some car lanes with transit-only lanes and re-opening the abandoned streetcar terminal under Essex Street on the Manhattan side of the bridge. Current proposals include replacing the terminal with an odd subterranean mushroom park. But if the real estate industry ever gets serious about funding a public-private waterfront streetcar through Williamsburg, perhaps restoring the rail lanes to the old streetcar terminal could be added to the plan. No matter what the MTA decides, the coming L train closures are an opportunity to start getting creative with our transportation systems and our waterfront. Let’s hope at least some of these mitigation proposals get a serious hearing. Alex Armlovich is a policy analyst at the Manhattan Institute. On Twitter @aarmlovi. 1. NYPD Use of Force: On Thursday, the NYPD announced a set of new guidelines and a tracking system to document officers' use of force. Officers will be required to detail every instance when force is employed, not only during arrests but brief detention-and-release incidents. The NYPD will also track use of force against officers. The announcement comes after City Council members have introduced legislation to require an "early warning system" be put in place to identify officers who use force inappropriately and on the same day as a new NYPD Inspector General report on use-of-force was released. 2. Cuomo’s Buffalo Billion Under Federal Investigation: Federal investigators are looking into how contracts were awarded in Governor Cuomo’s Buffalo economic development program. The Buffalo Billion program is intended to infuse $1 billion into the upstate economy and create 14,000 jobs, but has become the focus of a corruption investigation by U.S. Attorney Preet Bharara, who has issued subpoenas to major entities involved. 3. Chief Judge Takes On Bail: On Thursday, New York Chief Judge Jonathan Lippman announced a series of initiatives aimed at addressing what he called the “unsafe and unfair bail system,” including automatic review of bail for misdemeanor cases. 4. 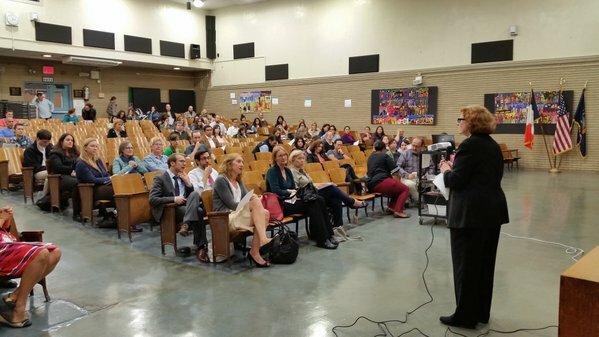 Debate Over Rezoning of Brooklyn Schools: The Department of Education came under fire on Wednesday at a hearing on the rezoning of two Brooklyn schools. The DOE’s proposal is intended to ease overcrowding one school, but the proposal has sparked debate over race, school equity, school quality, and school desegregation and integration. The de Blasio administration has done little to explicitly address school segregation, but the rezoning at play in Brooklyn is at least somewhat inadvertently moving the issue. 5. Movement on MTA Funding: The de Blasio administration appears to be moving toward meeting more of the funding requests made by the MTA, a state agency, even as the Cuomo and de Blasio administrations continue to spar publicly about responsibility, funding levels, and other aspects of the issue. $1.8 billion is how much prosecutors are investigating Port Authority of New York and New Jersey officials for diverting from the Hudson River rail tunnel. The funds were spent on state-owned roads instead. 18% decrease in the number of incidents where New York police officers fired their weapons thus far in 2015 compared with the same period last year. It was a good week for Staten Island commuters, as the city's ongoing repaving efforts continued, with some help from Mayor de Blasio, under the supervision of Borough President James Oddo; and the official start of expanded Staten Island ferry service, by which the ferry will run every half-hour all the time. It was a bad week for gun control advocates, in New York and elsewhere, whose frustration continues to grow amid news of another mass school shooting, this one in Oregon. Governor Cuomo has had especially harsh words for federal officials who refuse to act on gun regulations such as expanded background checks. Around this time last year, on September 30, 2014, Mayor de Blasio signed an executive order to expand New York City's living wage law to cover thousands of previously exempt workers and to raise the hourly wage itself for workers who do not receive benefits. The move was criticized by Comptroller Scott Stringer.